This little feller from the land Down Under is a happy dog that loves everyone. Fond of children, the elderly, and the handicapped, the Australian Terrier makes the ideal companion for a variety of households. 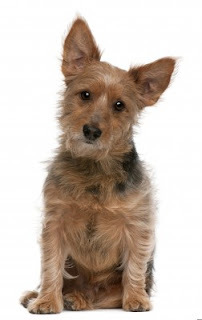 From its origins as a vermin catcher, the Australian Terrier is the smallest of working terriers. But don’t let its size fool you – this breed is full of pep and energy. That means it needs a good amount of exercise every day, so long walks or an unleashed run in a safe area are essential. There is so much to love about the Australian Terrier. It fits in with families and likes being outdoors. Just a few of its endearing traits include that it is fairly quiet, fun, energetic, tough, eager to please, and adventurous. If you plan on leaving it in the backyard, be warned – the Australian Terrier likes to dig up a storm. The Aussie is all terrier, and not everyone finds his favorite hobbies endearing: he loves to bark, dig, and chase. Bossy is the Aussie's middle name. He wants to be the dominant dog in a multidog household (males can be cranky with other male dogs). In fact, he'll happily take over the role of pack leader among people, too — so be sure to establish yourself as the boss before he does. Early training and socialization are musts to keep this dog happy and well liked by family and friends, both human and animal. The Aussie's personality is active and lively. If you prefer a dog with a more subdued nature, look at other breeds first. The Australian Terrier was the first breed developed in Australia to be shown and recognized by the kennel clubs of other countries. The Australian Terrier is descended from the rough coated type terriers brought from Great Britain to Australia in the early 19th century. The ancestral types of all of these breeds were kept to eradicate mice and rats. The Australian Terrier shares ancestors with the Cairn Terrier, Shorthaired Skye Terrier, and the Dandie Dinmont Terrier; Yorkshire Terriers and Irish Terriers were also crossed into the dog during the breed's development. 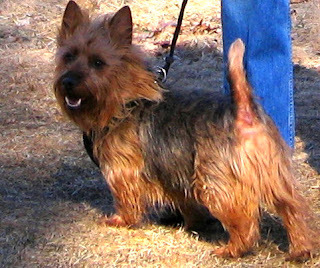 Development of the breed began in Australia about 1820, and the dogs were at first called the Rough Coated Terrier. The breed was officially recognised in 1850, and later renamed as the Australian Terrier in 1892. 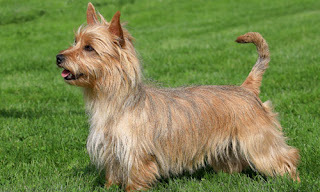 The Australian Terrier was shown at a dog show for the first time in 1906 in Melbourne, and was also shown in Great Britain about the same time. The Kennel Club (UK) recognised the breed in 1933. The American Kennel Club recognised the Australian Terrier in 1960, and the United Kennel Club (US) in 1970. It is now recognised by all of the kennel clubs in the English speaking world, and also is listed by various minor kennel clubs and other clubs and registries. The Aussie is a fun-loving, upbeat dog who makes a great companion for any individual or family who wants to share his energetic lifestyle. Devoted to his owners, he's happiest when he's part of daily family life. He likes to be in the house, playing with the kids, following you room to room, or shouldering his way to the front door when you greet a friend. He is clever and should be easy to train — as long as you keep him busy and never, ever bore him. The average life span of the Australian Terrier is 12 to 15 years. Breed health concerns can include allergies, arthritis, cancer, cataracts, diabetes, Legg-Calve-Perthes disease, patellar luxation and thyroid problems. Generally, Australian Terriers are hardy and healthy little dogs. A well-behaved housedog, the Australian Terrier should be allowed to spend lots of time with its family. However, in order to prevent frustration, this adventurous and playful breed requires daily exercise in the form of a playful game, a moderate walk, or an off-leash run. The wire coat requires combing every week and stripping of dead hairs twice a year. For a neat look, the hair around the feet should be trimmed. This terrier was bred to tolerate harsh Australian weather conditions, thus it can stay outside in warm and temperate climates. The Australian Terrier is good for apartment living. It is fairly active indoors and will do okay without a yard provided it is taken for walks on a lead. They should not be allowed to roam free because they have a tendency to chase. Once firm leadership is established, Australian Terriers can excel in training. Though small and generally possessing the desire to please, Australian Terriers are also independent and like to be the boss. Early training and a confident air can teach the Australian who is really in charge of the home. Positive reinforcement and rewards are the best method to train this breed. Like other breeds of terrier, Australians are quick to bark and quick to take a chase. 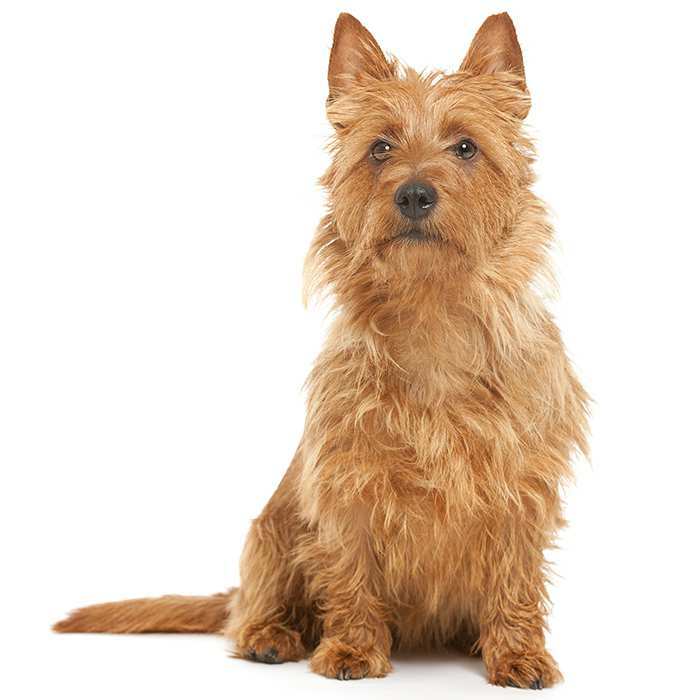 Though they may listen to you one-on-one, if an Australian Terrier takes off after a small animal, he probably won't obey your commands to come home. For this reason they should be kept on a leash or in a fenced-in yard at all times. For a small dog, the Australian Terriers sure has a large amount of energy. That’s why it needs lots of regular exercise. Because this breed likes to hunt and herd, it helps to have a yard where it can chase toys and birds. If you have an apartment, daily walks or trips to the park are a must. A dog for a range of lifestyles, the Aussie fits into any household. This breed loves children, so use them to exercise Australian Terrier. Games, jogging, hikes and other outdoor pastimes will keep the Australian Terrier amused. Also needed is mental stimulation – interactions with new people, animals and experiences are good for your Australian Terrier’s mental health. There is nothing complicated about grooming an Australian Terrier. Brush his coat once a week with a soft slicker brush, trim his toenails once a month, and bathe him in mild shampoo as needed every three months or so. Check the ears once a week for dirt, redness, or a bad odor that can indicate an infection, then wipe out weekly using a cotton ball dampened with gentle ear cleaner recommended by your veterinarian to prevent problems. Regular tooth brushing with a soft toothbrush and doggie toothpaste will help keep the Australian Terrier’s teeth and gums healthy and his breath fresh. Introduce him to grooming when he is young so he learns to accept the fuss and handling of grooming graciously. The Aussie makes a wonderful family pet, well suited to families with kids. He loves to play but, like all dogs, should be properly socialized and supervised around very young children. He prefers to be with his people and can become destructive when left alone too long. He also has a penchant for chasing cats and small animals, so he isn't best suited to homes with rabbits, mice, or hamsters. However, with patient training, the Aussie can be taught to respect and leave alone the animals he lives with — but only those he lives with. He will eagerly chase the neighbor's cat or a squirrel at a park. 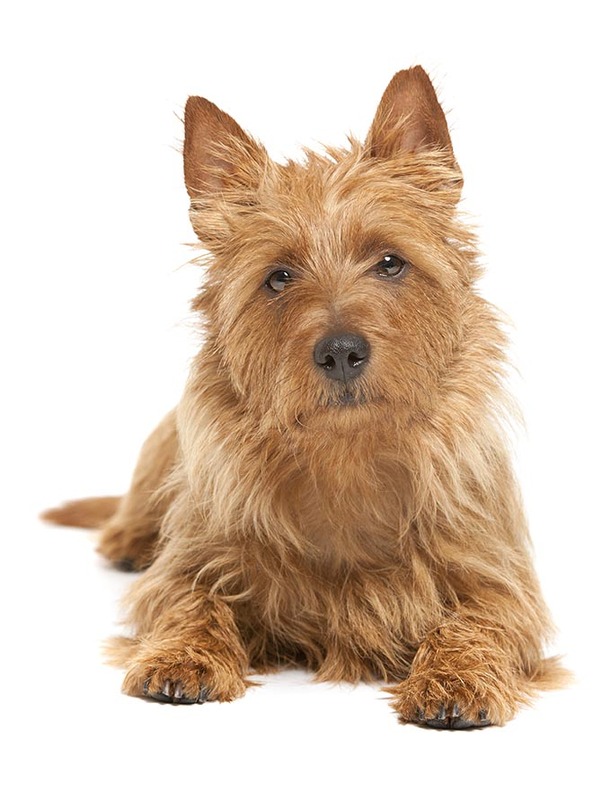 Is the Australian Terrier the Right Breed for you? Moderate Maintenance: Regular grooming is required to keep its fur in good shape. Occasional trimming or stripping needed. 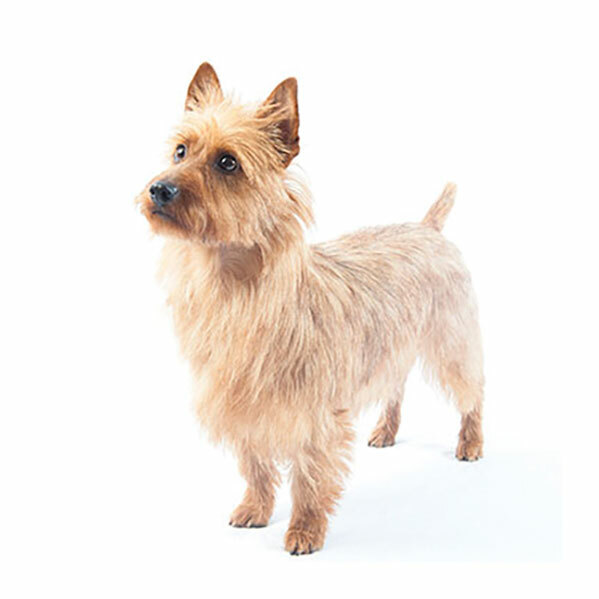 Moderately Easy Training: The Australian Terrier is average when it comes to training. Results will come gradually. Australian Terriers first came to the United States in the late 1940s from Britain and Ireland. The Australian Terrier Club of America was formed in 1957.